Additionally to my article on Wings of War that I published a couple of weeks ago - focusing on the packages settled in World War I (follow this link), this time I want to emphasize on the latest expansion "Dawn of War" and especially on the new miniatures. Beside the fact that "Dawn of War" takes place in World War II, also the game mechanics have been changed a little. The greatest changes can be found in the planning of the maneuvers and the maneuver decks (you can also choose the speed now for example) and in the damage decks, making the game more strategic and offer a greater level of simulation feeling - in my opinion it's also more intense, and worth to get it even if you already own one of the first sets. What I liked best though are the great miniatures of planes that are available now. They are of pretty good quality and rich in detail, and when replacing the usually used cards for representing the participants in the exciting aerial combats the atmosphere is simply great - making the whole game even more appealing and realistic!! Add a new dimension to Wings of War with Wings of War: Miniatures! 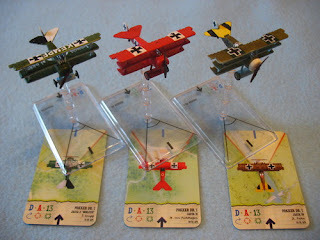 The award-winning game mechanics of Wings of War remain unchanged in the Wings of War: Miniatures boxed sets: easy, fast, fun rules for re-creating aerial combat in the 20th Century. But now, beautifully painted and assembled 1/144 scale planes replace the plane cards for an enhanced visual experience and the joy of collectors and aviation fans! 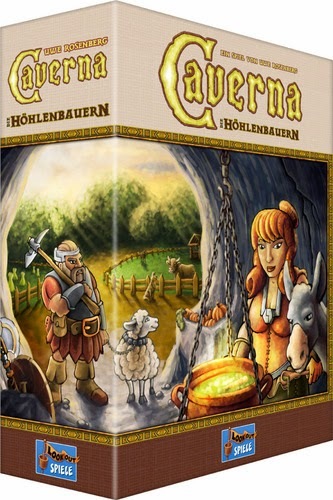 Each will have a special playing base with all the information you need play Wings of War. Wings of War: Miniatures will be available in two formats: complete sets with 4 planes, maneuver cards, control boards; or single-plane blisters, each containing one 1/144 model plane, assembled and painted, its deck of maneuver cards, and decals to customize the plane. The boxed sets are an ideal introductory set or a gift, while previous owners of Wings of War may directly go and get the single- blisters to enhance their gaming experience and create a unique collection! The first series includes some of the most popular planes of WW1: the Fokker DR.I, the Sopwith Camel, the Albatross and the SPAD XIII, each in multiple versions with different color schemes. "Dawn of War" is the first set in the new series of Wings of War games, which will allow you to re-create dogfights, bombing missions, escorts, and endless other aerial combat situations set in World War Two. 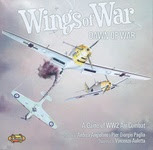 Including fighter planes from the first years (1939-1941) of the war, but also used later in the conflict, "Dawn of War" provides the foundation for a new, exciting evolution of the Wings of War system. Pilot a Spitfire, a Messerschmitt, a Hurricane, a Wildcat, a Zero... Up to 6 planes can fly with the contents of this set, for scenarios with 2 to 6 players.